The end of our tale has arrived. It’s been full of passion, heartbreak, and lightning bolts. We pick up immediately where we left off as Kelda, in an attempt at redemption or to lessen her guilt or simply out of moral integrity, visits Bill’s parents to tell them about their son’s death. Of course they’re upset, but not as much as a squad of Norman Osborn’s trigger-happy soldiers lying in wait on the front lawn. Because while Bill’s family forgives Kelda, inspires her to move on, and patches up her gaping emotional wound, it’s Kelda herself who has to take that baby step forward to being happy once more. Though impaling bad guys with ice spears must be at least a little therapeutic. 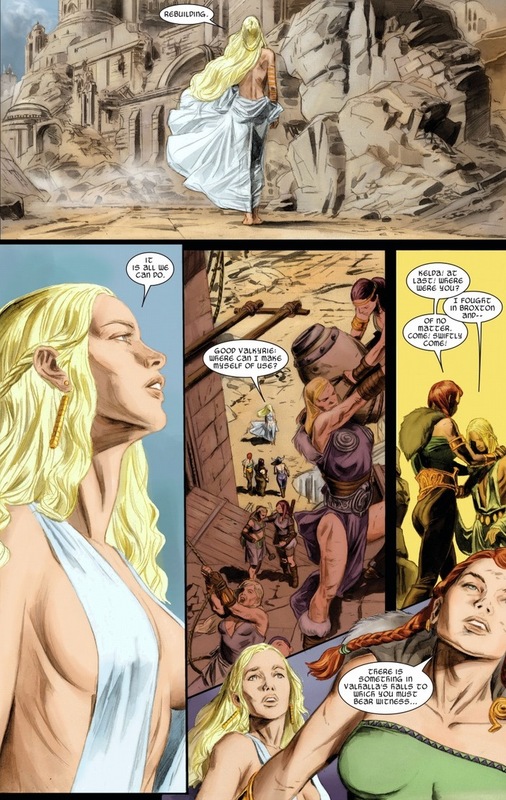 She arrives at Asgard in the aftermath of Siege, the event that turned Asgard into a pile of magical rubble. Oh, and how do you feel about thrilling plot twists? 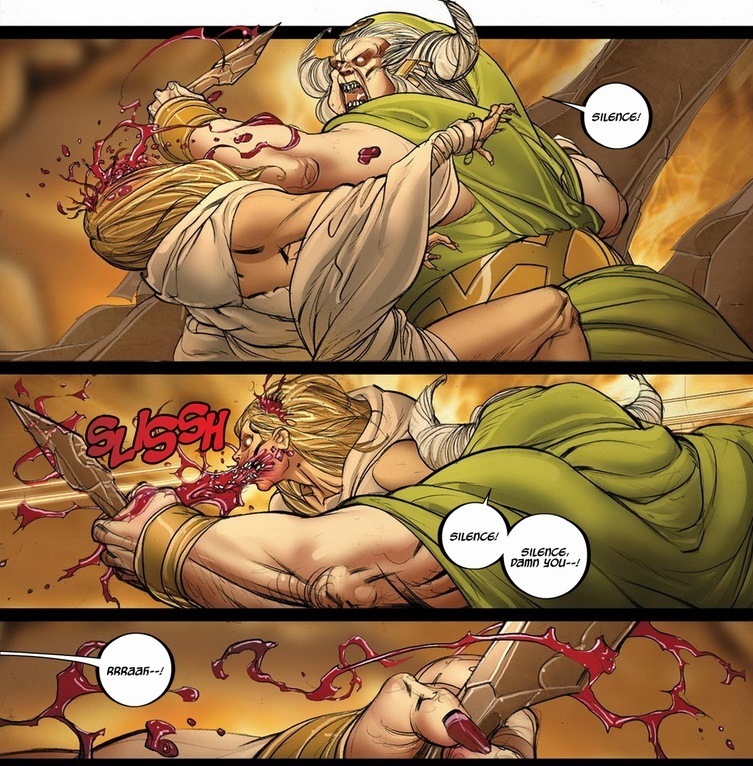 Bill died a hero’s death, even killing one of the grosser-looking Asgardian traitors as Bill breathed his final breaths. 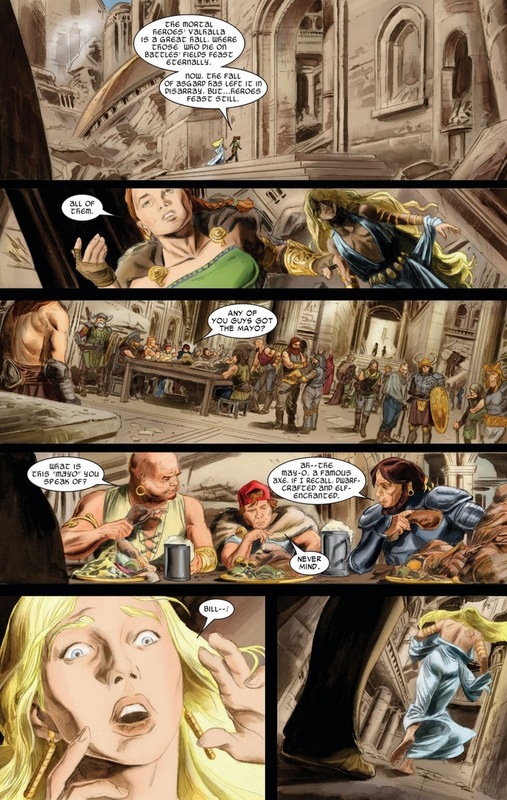 And in the Norse mythology which Thor’s Asgard is based on, soldiers who die valiantly in battle spend eternity in Vahalla — where they war in the morning and dine in the evening. Repeat forever. It’s Viking Heaven. And damn right does Bill deserve a place in these halls. Now, our protagonists live in a world of magic and aliens and miracles — if there is any universe where Kelda can find a way to reunite with her soulmate, it’s Marvel’s. But despite her ability to summon tornadoes with the flick of the wrist, her necromancy isn’t at the same skill level. Or probably allowed. And as you know, when all avenues have been explored and favors called in, those desperate enough often turn to more unethical methods. 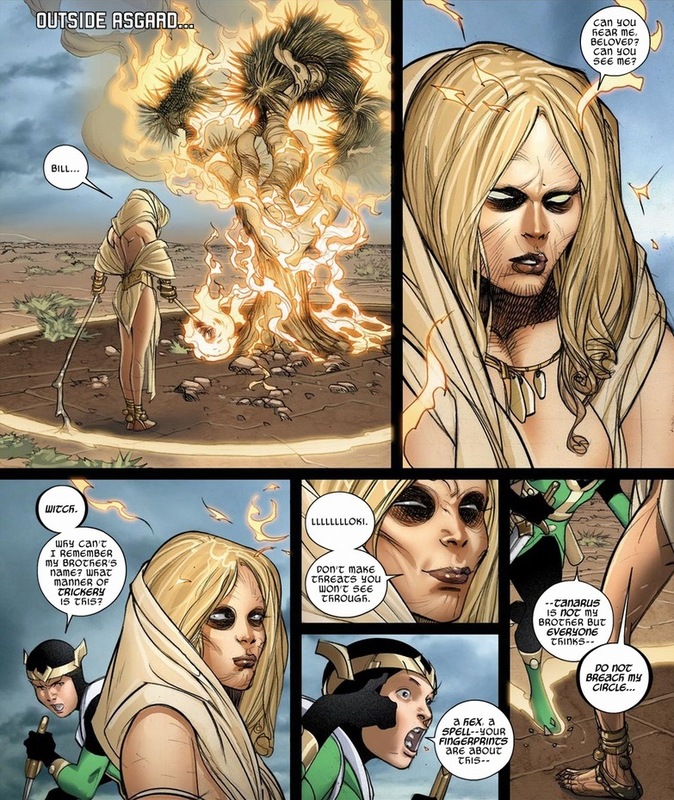 Like Kelda lighting child Loki on fire. Yes, that’s definitely not the Kelda we remember. But standing next to Kelda, the chief witch or shaman queen or druid boss or whatever she’s called has offered our hero a deal: if Kelda’ll help her with one tiny harmless spell, she’ll bring Bill back to life. 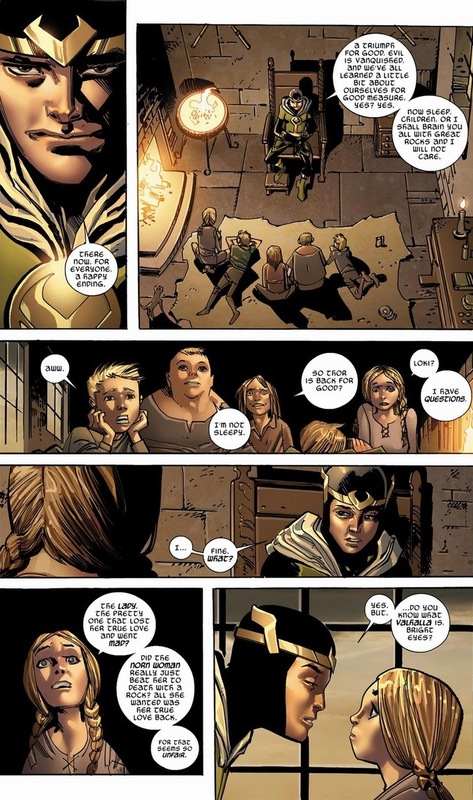 Y’see, Thor died during the Marvel event Fear Itself. 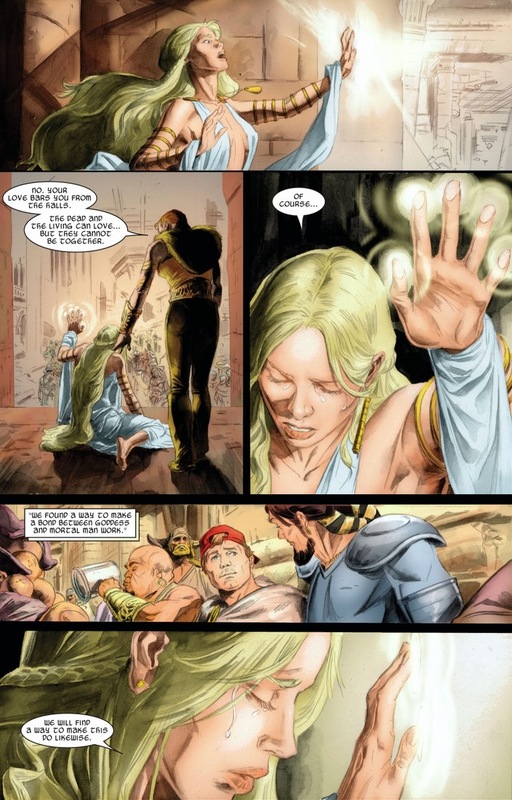 Taking advantage of this opportunity, the evil magician lady used Kelda to summon forth Tartarus, a dude who took Thor’s place in the mind of all of those who knew him. Except child Loki. Look, I understand that for all the good Kelda represents, it’s odd to see her as an villain’s accomplice. Though the sheer number of superheroes have done some vicious things for their loftier goals is staggering. Seriously, the Avengers and X-Men alone have been to Hell dozens of times just to pull one of their buddies free. If they can make deals and punch demons, why can’t Kelda dabble in the dark arts for her true love? We all know that Bill’s worth it. Poor Kelda’s too obsessed to notice the wizard lady’s lying. That’s the problem with working for supervillains — they so rarely keep their promises. Plus, as most supervillains partnerships end, we can only look forward to blood and tragedy. Our goddess has done so much and sacrificed even more for a mere chance of a reunion, but we as readers know the only way this can play out — and it’s so frustrating to watch. I wish I had better news, but even goddesses can’t survive their faces getting ripped open. It’s a wildly (and maybe unnecessarily) violent death for Kelda, but we must remember that she died pursuing truth. And justice if she hadn’t gotten knifed. Tricked or not, Kelda died fearlessly facing down vile and horrific opponents, and well, there’s a funny thing about a death like that. While big-time superheroes can never sail off into the sunset to their expected bliss (it’d hurt profits), minor characters don’t have those same shackles. Our two lovers are free to experience an ending that they deserve. That we deserve. So as our love story concludes today, I have never been more excited to announce that we finish the only way I would ever accept — brilliantly, romantically, and eternally happy. See you on Monday! I hope you have the best weekend! Thank you, Mr. Levine. That was awesome, and I appreciate all the time and effort you put into this. I would like to thank you by having all your babies. Yeah- fantastic! Thank you, thank you, thank you!!! Thank you so much for this 4 Part series. I had no clue about this epic romance that took so many tragic turns until their “happy” ending. It was simply a fantastic story indeed! Ah, it’s totally a happy ending (without the quotes)! They’re now both immortal, living in the permanent fighting/partying/loving-repeat-forever Viking Heaven and they have each other, complete with the full-on PDA dining hall make out session we ended on. I’ve always wondered about that – do they have private rooms in Vahalla, or do they just get it on in full view on the table next to the mashed potatoes and cranberry sauce? There is a single page scene like six issues later where they’re married and in (I assume) their own room. Bill’s staring at an explosion or something and Kelda’s asking him to come back to bed. Though if Bill and Kelda are into dinner sides, I’m not going to judge their fetishes. I remember reading this, and loving the way the story played out, but after Siege I sort of wandered away from the Thor related books. Was the last part (what you call part 4) written by the same writer as the first? I remember the love story was started by JMS, but thought Fraction took over writing by the time Seige hit. I greatly enjoyed your recap, and as always, think you do a great job of giving fans a nice taste of books they may not be into, leaving them wanting more. Love it. Thank you very much. 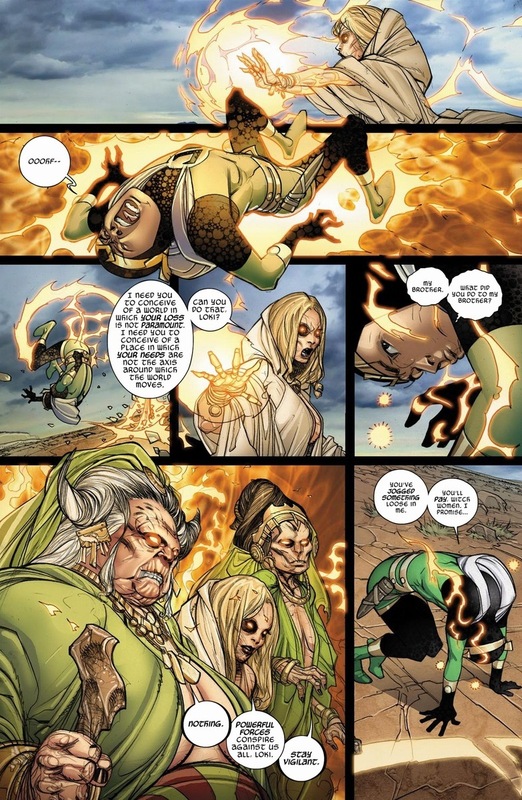 Now I have to see how their story goes after they got out of Valhalla to stop Surtur from burning Asgardia. Kelda deserved to die in a better way than that. But it’s nice to see them reunited – I didn’t know that would eventually happen.